Top Mark Solutions carry out graffiti removal for business premises in Manchester and across the North West, helping to restore a more aesthetically pleasing exterior that makes the right impression on customers, other visitors and on anyone passing by. 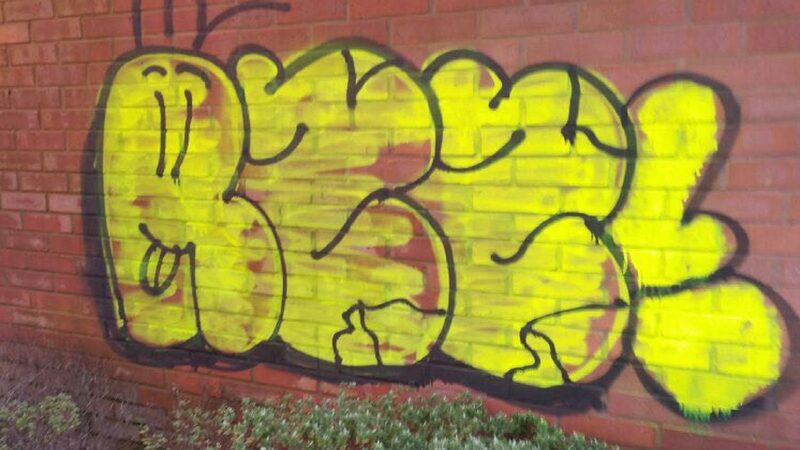 But it goes beyond just the visual impact of unsightly graffiti tagging, as when left unchecked, this kind of antisocial behaviour can quickly accelerate and leave your business premises at increased risk of other crime. A single graffiti tag can act as a beacon to other ‘artists’ in the area who will add their own tag alongside it or over the top, creating an even more unsightly collage and extending the problem over more of your exterior walls. If this is allowed to continue, it can also make it appear that your premises are not well cared for, and can even highlight the fact that your perimeter fences are not secure, leading to opportunistic theft and vandalism. Even if this does not occur, graffiti on walls that are in direct line of sight for passers-by, customers, employees and investors sends the wrong message and can often include offensive language or imagery. How do I remove graffiti from business premises? Paint over it with a solid colour. Sand-blast the surface off of the brick/stone. Pressure washing to remove graffiti from deep within the surface. Ideally you want to be left with a clean, natural-looking surface, so in many cases this rules out simply daubing a patch of plain paint over the top of any graffiti tags on your walls. Sand-blasting is also not ideal as it can damage the exterior surface of the walls and can lead to ghosting, where the image of the graffiti is effectively engraved into the wall where the surface has been removed. Our hot pressure washing service does not leave ghosting and does not damage your masonry. Instead, it uses a combination of high pressure and high temperature to lift graffiti paints out of stone, brickwork and render, or to blast it off of non-porous surfaces. We also offer cold pressure washing to remove graffiti using state of the art equipment, and can remove chewing gum from floors and walls if required too, restoring the professional appearance of your business premises. For a free site survey or no-obligation quote for graffiti removal in Manchester or elsewhere across the North West, get in touch with Top Mark Solutions today on 0161 976 2382 or info@top-marksolutions.co.uk. Next Next post: Back to School – with Top Mark Solutions!